I have been sick for the last couple days, but as any mother I am still cooking dinner, cleaning counters, washing dishes, organizing toys, folding clothes, feeding pets, brushing teeth, fixing breakfast, making lunch, preparing endless snacks, breaking up fights over barbie dolls and stuffed animals, and setting timers for how long everyone gets to swing on the hammock chair on the right. This morning Robert told me he was getting sick. He asked me to get something for him and I laughed and said, "you know I have been sick for three days, right?" His response: "yeah, but it hits guys harder. You don't know how I feel." The first thing that popped into my head was ... well you don't know how fast this remote in my hand can fly across the room at you .... He quickly said, "Women's bodies are more built for stuff like that." Which may have honestly been just a good save, but it got me thinking .... Are women just stronger in the sense that we can mentally separate being sick and having to care for everyone around us, or are we just such nurturers that we don't out ourselves first? Or is it really that we are just control freaks and have to do everything? This is the second blood orange cake I have made this week and it's a winner. The first cake I made was too moist and had no hint of blood orange. I added zest and more juice this time and orange chocolate to the frosting. It's freaking delicious. Recipe below! 2. Place 1 cup of the sugar in a bowl and using your fingers, rub the orange zest into the sugar to release the oils. Whisk in the flour, baking powder and salt. Set aside. In the bowl of a stand mixer fitted with the whisk attachment, beat the egg whites on medium speed until foamy, about 30 seconds. Add the cream of tartar and the remaining 1 cup sugar, raise the speed to medium-high and beat until stiff peaks form, about 3 minutes. Set aside in another bowl. 3. In the clean bowl of the stand mixer fitted with the clean whisk attachment, beat together the egg yolks, oil, milk, vanilla and orange juice on medium speed until pale yellow, about 2 minutes. Add food gel coloring if desired. Stop the mixer, add the flour mixture, and beat on low speed until combined, about 30 seconds then beat on high speed for 30 seconds. Stop the mixer and using a spatula, gently fold in the egg whites until just combined, taking care not to deflate the peaks. 4. Divide the batter evenly between the prepared pans. Bake about 40 minutes. Let the cakes cool in the pans on wire racks for 10 minutes, then invert the cakes onto the racks and let cool completely. 5. To make the frosting, combine the butter in a stand mixer using the whisk attachment and cream the butter for 2-3 minutes until it is almost white in appearance. 6. Add the powdered sugar and cocoa powder, 1 cup at a time, while mixing on low speed. Cover the mixer with a dish towel, if needed, to prevent powdered sugar from blowing out of the bowl. 7. Add in the salt and vanilla. Continue mixing on low and add the heavy cream, one tablespoon at a time. 8. Place your chopped chocolate in the microwave and heat at 30 second intervals, stirring in between each time until melted. With the mixer still running, drizzle in the melted chocolate, allowing it to mix in completely. Turn the mixer to medium and beat for 1-3 minutes, until the buttercream is light and fluffy. 9. To assemble the cake, place 1 cake layer on a serving plate. Spread an even layer of buttercream over the cake, then top with the other cake layer. Refrigerate until set, about 10 minutes. Frost the outside of the cake as desired with the remaining buttercream. 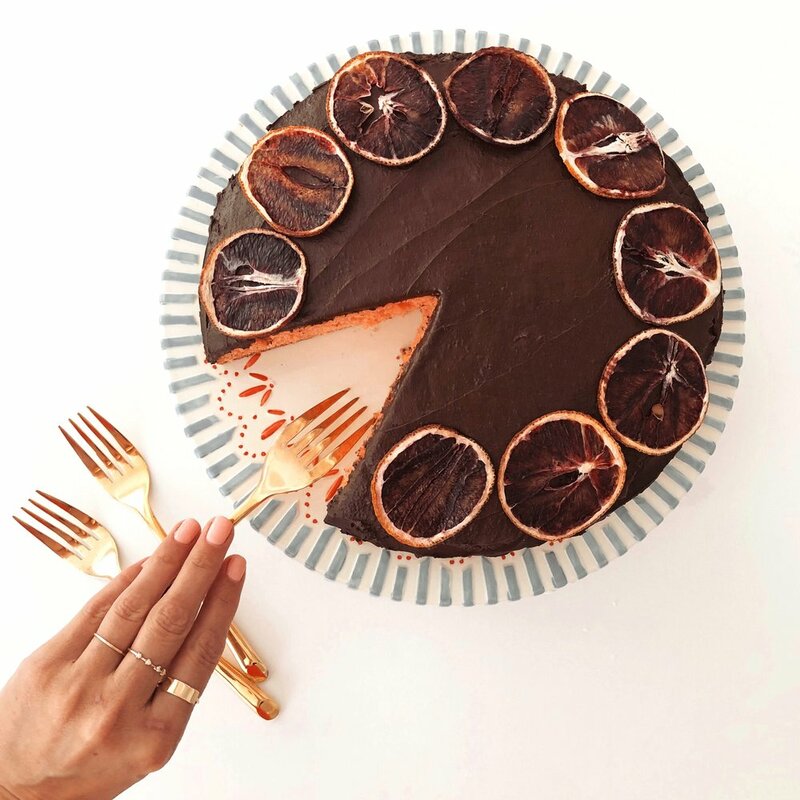 Arrange the candied blood orange slices on top of the cake and around the base and serve. Serves 12.